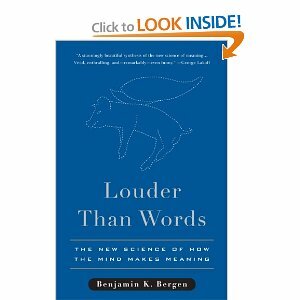 Ben Bergen’s book Louder than Words: The New Science of how the Mind Makes Meaning advocates for embodiment as the source of deriving meaning from language. The argument is that by simulating (creating experiences of perception and action in our minds in the absence of their external manifestations), we understand language. One piece of evidence that supports the embodiment hypothesis is the Perky effect. In this famous study, participants were asked to fixate on a screen and visualize various objects. While they were doing so, Perky projected a faint patch of color (just above the visibility threshold, and the same color as the objects participants were visualizing) onto the screen. Afterwards, every participant believed that what they “saw” on the screen was solely a product of their imagination, instead of an actual physically present stimulus. Bergen points out that the Perky effect is common in everyday life: when you daydream, your eyes are open and you’re completely awake, yet you’re imagining something else that isn’t there. While doing so, you don’t process as much of the visual world around you as you might otherwise. The results suggest that there isn’t a black and white difference between the experiences of perceiving and imagining, but instead the difference between imagining a stimulus and actually perceiving it is a matter of degree. This makes simulation as a means for understanding language seem quite plausible. The results also suggest that imagining can interfere with perception. This is really cool to me, because it demonstrates the importance of context for cognition. If the participants in Perky’s experiment hadn’t been visualizing shapes, they most likely would have reported seeing the faint colors projected on the screen. Similarly, if I’m daydreaming while driving down the street, I’m much more likely to perceive my surroundings quite differently from if I’m fully focused on my driving. This is a reminder to me that context is inescapable and will always color our perceptions of reality. Pingback: Embodied Language Conflict | Whats in a brain? When can we eliminate participants?